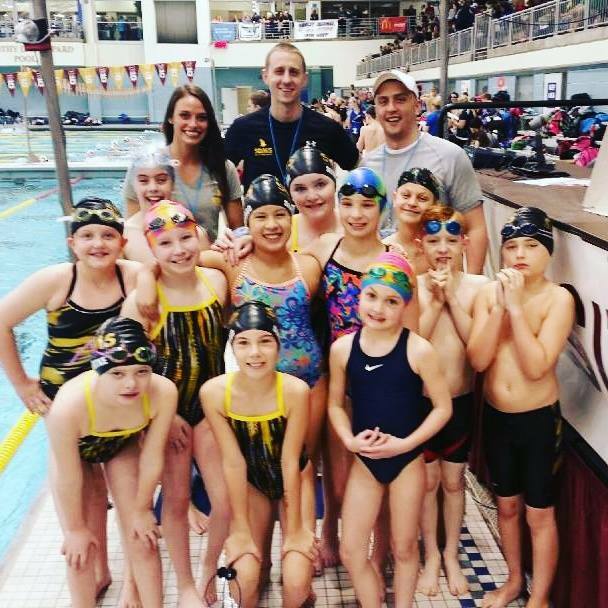 The Seahawks swam great at the big Midwest Regional swim meet held in Minneapolis, MN over the weekend (4/8-4/3) finishing in the top 10 for the first time! South DM Swimming earned 836 points and finished 9th of 76 registered teams from nine states (a meet record). That’s 283 points (and 4 places) better than SDMS’s 2015 finish! Plus, 25 SDMS team records were broken at the meet this weekend! Check out the full list of team records to see which were broken. Over the last few seasons, more and more local swim clubs from Des Moines have started attending Midwest Regionals too. Here’s how the Seahawks compared to other Des Moines metro teams. Keegan Kraft earned 5th in the 8 & Under 25 Breaststroke with a 22.42 (-.59 of a second) and 10th place in the 50 Breaststroke with a 51.75 (-1.80 seconds). Torin Lackmann took 8th place overall in her 11-12 100 Breaststroke with her new best time, 1:15.50. Javier Santiago dropped time in all four of his events and took first on the SDMS team with a individual point total of 53 points! You can view the full meet results to see all of the great swims by the Seahawks. You can also see the final team scores. View just a few photos from the meet below.